TTVOVO Cremation Urn Necklace for Ashes Engraved Forever in my heart Charm Pendant Memorial Keepsake Bereavement Stainless Steel Jewelry by TTVOVO at The Black Pearl. MPN: N325. Hurry! Limited time offer. Offer valid only while supplies last.  CREMATION URN NECKLACE - Love heart cremation urn memorial pendant, engraved "Forever in my heart", love heart shape are very hot style, a unique design ash pendant. You can open it and holds the ashes or hair/fur of your loved ones. A very unique gift to help remember the passing of a loved one forever. A lovely way to remember a special someone & keep tem close to your heart at all times.  SIZE DETAIL - Heart pendant 20 mm x 30 mm, come with a free cable chain length 22inches(56cm), lobster claw clasps, the chain can be cut to any length by tools, make sure it will fit perfectly on anyone.  MATERIALS - Made of high quality 316l stainless steel, hypoallergenic, high polish smooth, no scratches the skin, sturdy and durable, and it will not rust, corrosion, change color or tarnish. It is an amazing metal for jewelry that will last forever just like the memory it represents. 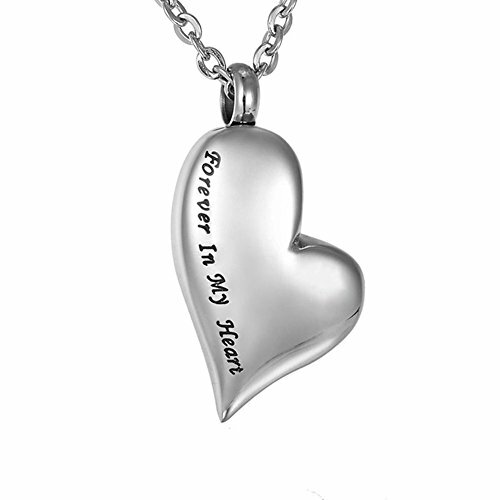  KEEPSAKE MEMORIAL JEWELRY - Keep your loved one's memory close to your heart always. The neutral design of this pendant makes it ideal for both men and women, A memory of your mom, dad, grandma, grandpa, friend, sister, brother, pet etc. It can safely secure your most sentimental contents such as dried flowers, seeds, a lock of hair or ashes etc. An ideal gift for your lover, families and friends, suitable for daily, party, anniversary, birthday or any other special occasions.  NO RISK PURCHASE,100% MONEY BACK GUARANTEE - Since your satisfaction is our top priority, we offer 100% money back guarantee for every customer. We conduct the policy because we have full confident about our product. Just contact us via your order information in Amazon, we take pleasure to offer you a full refund or new free replacement if you do not like it. Your review and feedback make a better TTVOVO. Cremation jewelry makes a beautiful and thoughtful gift to commemorate a lost loved one. If you have any questions about this product by TTVOVO, contact us by completing and submitting the form below. If you are looking for a specif part number, please include it with your message.